Summary: When journalism meets health care, the path is not always smooth. Here’s what happened when Melinda Beck, a Wall Street Journal reporter writing an article about health care pricing, got in touch with Memorial Sloan Kettering Cancer Center here in New York to check a price on the ClearHealthCosts.com web site. Beck had interviewed me about ClearHealthCosts.com, and she wanted to confirm the listed price of $125 for a screening mammogram that our journalists had collected from Sloan Kettering for our database of cash or self-pay prices. When she inquired, she was told by Rebecca Williams, a media associate in the department of communications at Sloan Kettering, that $125 was not correct — that the charge is $445. When Beck told me, I emailed Williams. I said I wanted to make sure we had the correct number on our web site, per our standard procedures. I asked Williams for the correct price for that screening mammogram, CPT code 77057 or HCPCS code G0202, and also sent her a spreadsheet asking for several other prices: a colonoscopy, some blood tests etc. — the standard, “shoppable” procedures that are in our database. She asked how we collected prices, and I told her. She did not reply by sending the price I requested, so I asked if the $445 price she had given Beck was one we should use. No answer. I asked again. No answer. So I decided that Williams is a good source, in a written communication with a Wall Street Journal reporter, to cite for this price, and that her figure would almost certainly be correct. I’m changing our database to reflect that. You can see it here, or by searching mammogram in New York City. We have heard occasionally from people questioning our prices. In every case, we seek to establish what’s correct. Once, a business office person from a medical practice in Long Island called to say a patient had directed her to our site, and that the prices were wrong. I told her what reporter here had talked to what representative at her office. She supplied new prices, and we changed our database. Another time, a public relations person for a hospital near Philadelphia emailed our partners at WHYY public radio in Philadelphia to say a crowdsourced price for a colonoscopy at that hospital needed to be corrected — that the patient had clearly misunderstood something, because he paid more as an insured person for a colonoscopy than an uninsured person would have paid. We examined bills and explanations of benefits, and talked to everyone in question. Apparently a group of doctors with a practice on the hospital grounds — though not strictly part of the hospital — had been charging an extra-high facility fee, and the hospital wasn’t aware of it. So yes, our data was correct. 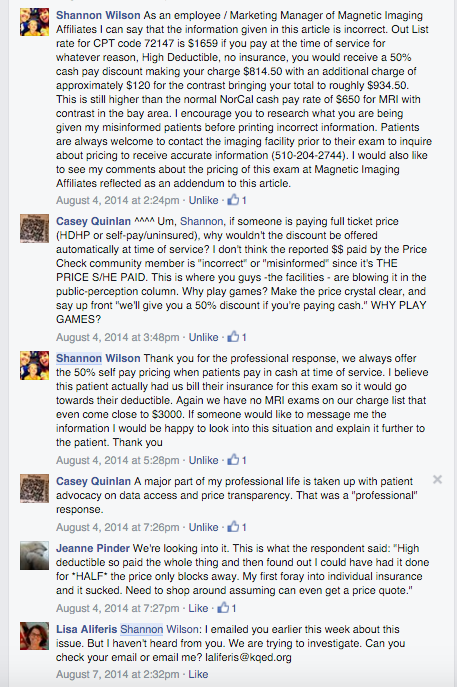 Another time, a representative of a provider in San Francisco messaged our Facebook group to complain about a price. After a lively exchange of opinions, she stopped replying to emails and requests for comment (see screenshot at right). So … we’re assuming our data is correct. The problem may have been that the patient paid the full price, while the cash rate would have been lower. With the original complainant not responding to repeated requests for comment, it’s hard to say that she’s insisting she’s right. Indeed, we hear frequently that patients are being asked to pay a full sticker price — the charged rate, or “chargemaster” rate — if their insurance policy requires them to do so. That charged rate is often very much higher than the cash price. A note about our procedures: we seek to be very clear about where the data comes from. On our home site, Medicare reimbursement data is clearly marked as such. Beyond that, what’s clearly crowdsourced is marked with an aqua tint. If it’s not tinted aqua, our journalists collected it. 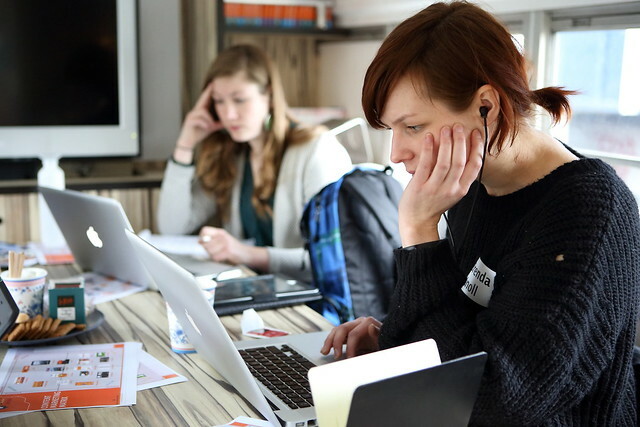 Here’s how our journalists do our survey — this is a blog post I wrote when we first launched, explaining our methodology. Some of our prices are crowdsourced, especially via our partnerships with public radio stations KQED in San Francisco, KPCC in Los Angeles and WHYY in Philadelphia. Those prices are also clearly marked — if they’re from one of our journalists, from a community member or from a health care provider. If they’re from a community member, they’re not always checked by our journalists — some of those who share don’t leave their email addresses — but when taken all together, the price information here gives a fairly robust picture of pricing. When people from the health care industry challenge our data, we try to verify that we have the right information. When they make that impossible, by not responding, we do the best we can. Honestly, wouldn’t it be easier if the prices were posted online publicly? Memorial Sloan Kettering and Magnetic Imaging Affiliates and others may not want to post prices, but it would certainly be a lot clearer for people. And it would make our job easier. More and more, people are paying out of pocket, in co-insurance, high deductibles, out-of-network charges and the like. They need to know what things cost. More and more, providers are publicizing prices. If we hear back from Williams, we’ll update. Questions, suggestions? Reach us at info (at) clearhealthcosts (dot) com.